This week I am celebrating my two year blog-aversary! Two years ago I switched over from Tumblr and wrote my first post in this blog. Back then I was wildly inexperienced as a runner with just a handful of blog visitors each day. 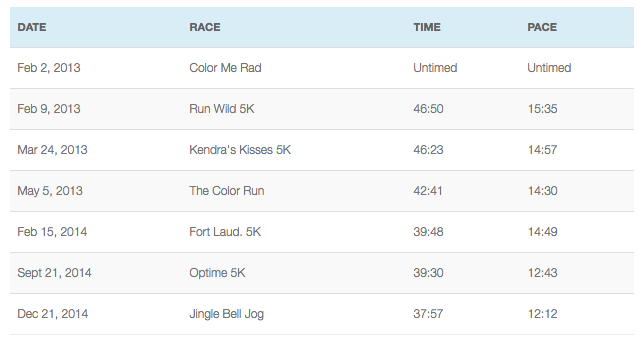 I was getting ready to tackle my third 5K and I hoped to run sub-40, but I ended up taking 46 minutes. I had no idea how to estimate how long it should take me to actually race a 5K based on my “training,” which mostly consisted of run/walking whatever I felt like each day. I wasn’t following a plan. I totally thought I could shave off 6+ minutes from my 5K time in just a month and a half! HAHA! Oh yeah, and I had NO IDEA how to pace myself in a race. I went out in that third 5K way too fast and ran a 10:30 minute mile for the first mile. It all went downhill from there (not literally). Let’s just say it took me about 20 minutes to crawl through mile 3. We all start somewhere right? Two years later and here I am. I’ve run sub-40 three times! When I first started blogging I had no idea what to expect. I didn’t know if running as a hobby was going to stick, and I didn’t know if I would be dedicated enough to blog about it every week. Since blogging is part of my day job, I vowed I would quit if this blog ever felt like work. I still plan to keep that vow, but so far I hasn’t even come close. 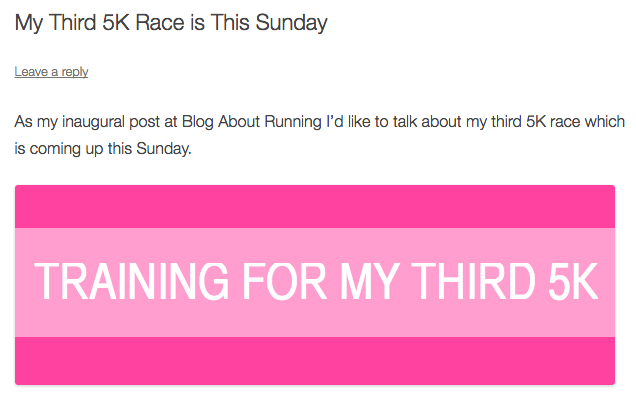 If running is my favorite hobby, blogging is a close second. So, today as I celebrate my two year blog-aversary I have to say THANK YOU for visiting my blog and making it such a rewarding endeavor for me! I really appreciate it! Next Post 4-Mile Loop PR! Nailed It. Woo hoo! Happy 2 year anniversary!! Happy blogaversary!!!! That’s so exciting. I look forward to following your continued running journey. That’s awesome! Here’s to many more happy blogging years! Congratulations on 2 years! I enjoy reading your blog and am glad to have found a fellow runner who runs around my pace. Thanks, Kate! It’s always so relieving to find another runner who runs at my pace. Good to know I’m not alone out there! 😉 Have a great weekend! Congrats on 2 years Kristina! I hope you blog for many more cause I’d miss you too much if you left! Your story about not knowing how the heck to pace yourself for your 1st 5K reminds me a lot of my own first 5K. I think at that point 5K was the longest distance I had ever run. I never paid attention to my pace, so I had no idea what time I would finish in (well, I didn’t really care, I just wanted to finish). Anyway, you were supposed to line up by pace in the starting corrals and I had NO CLUE where to line up. I actually remember thinking “7:30, I wonder if that’s me?” LOL! Your 5k time has really come down in the past two years! And that is without a 5k specific training plan like you are following right now…you are doing such an awesome job! I just started blogging about 2 weeks ago!! I love your attitude about stopping if it starts to feel like work. And it’s so great that your times have improved so much over the past year. Keep up the good work and I’ll keep reading!! Happy 2 years!! So glad that it this blog is something you enjoy because I love reading it and getting to know you more and more!!! Happy 2 years!! I love your blog!!! I have only been following you for a couple of months – but now it’s the first one I check every day!! I started running 5 years ago and had no idea what “pace” meant! But now I’m all about the PACE! I love it when I have “negative splits”! As for planks – still working on them! My best is 40 seconds…so I’m in total awe of you! Thanks for the inspiration!! Michelle, your comment made me feel like a million bucks! Thank you! Congrats on two years of blogging about your running journey! How far you’ve come! Here’s to many more! Happy blogiversary! I’m so glad I found your blog and connected with you :o) It’s nice to have a corner of the internet to call home and find new friends! Happy Anniversary! I think it is so cool that you have all of your progress as a runner and a blogger documented so you can look back on your growth. Reading your blog is always such a pleasure! I hope that you have many more years of enjoyable and productive blogging ahead. Happy Blogiversary, Kristina! It has been such a joy to read your blog and connect with you over the Internets. I’m still bummed I didn’t get to see you in Portland, but I’m sure there will be other races in the future. You continue to inspire a lot of people and it’s been fun watching you grow as a runner. Happy Blogging Anniversary!! I have enjoyed following your journey over the years so much and we have a very close timeline with our running. I found you because a Run Fast Mama send out a tweet and I clicked on her link 🙂 Your passion was contagious so I still click!